Tanker trucks loading/unloading propane, gas or flammable liquids are susceptible to ignition from static electricity. It take 26 mili joule of energy to ignite propane & 24 mili joule for gasoline vapour. A normal walk across a carpet in a dry weather helps humans accumulate equivalent to 30 mili joule of energy. That energy, if not discharged safely during loading or unloading of flammable materials, can ignite explosion. Earth Relay Units are used to earth static charge from flammable objects such as petroleum tankers. The ERU, ELMRU or ELMCRU are variants with different incremental features which can help users successfully earth dangerous static voltages in hazardous locations. ERU & ELMRU work on the principle Loop Resistance to secure hazardous objects of static voltage. While ERU comes with two earthing clamps, the ELMRU comes with three clamps, one of which can secure discharge arms. ELMCRU works on the basis of Loop Resistance plus object capacitance referenced to earth. It comes with three clamps. In case of ELMCRU, the actual value of Loop resistance is available through the RS 485 communication and it can be stored externally in the PC or a Data Logger. In order to allow the data to be stored longer, the scanning time to register the Loop resistance can be increased from a few seconds to an hour. The time between cleaning of files can also be pre-set and changed in the associated software. Spare Clamp sets are available with 5 meter & 10 meter cable for retrofit units. Earth monitor and resistance detector in the Earth Loop. We are supplying SmartScan Safety Light Curtain to cater to applications involving operator safety concerns. Industrial processes such as heavy-duty metal press operation involve critical safety hazard. Operator safety during such operations involves careful selection of sensors and safety controllers depending upon other process variants in the plant. A little information on types of optical curtains will help you understand how we can help create a complete safety system for your applications. The type 2 safety light curtains carry out a diagnosis of the internal circuits periodically. If a failure appears between the two test sequences, it is detected only after the next test. The design of such light curtains is suitable for applications where the HAZOP analysis has determined a minor injury risk for operators. Type 2 is usually less expensive than a Type 4 light curtain. 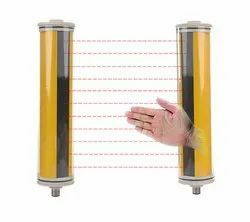 Type 2 optical curtain is available only for hand and body detection. The type 4 design is based on redundant automatic cross-checking architecture. This architecture enables immediate failure detection within the response time. The type 4 light curtains are suitable for applications where the HAZOP analysis has determined a moderate or high injury risk for operators. Type 4 is available for finger, hand, and body detection functions. Type 4 optical curtain provides a shorter response time and a narrower aperture angle. 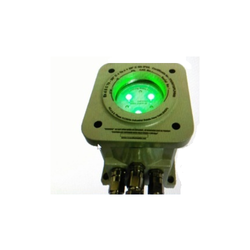 Looking for Devices for Safety in Hazardous Locations ?